explain or defend their positions. This helps illuminate the issues as dynamic struggles over resources and power and sustains student interest by presenting and analyzing competing perspectives. A four-part structure in each chapter assists students in systematic, critical thinking regarding international affairs. Every chapter begins with a historical overview of the issue at hand, including its origins, evolution, and current status. The author leads students in a lively debateplotting, discussing, and evaluating the different points of viewthen offers a scholarly and political assessment of the situation. This distillation of the discussion reflects meaningful distinctions among political positions and helps students to cultivate an appreciation for the nature and structure of the argument. 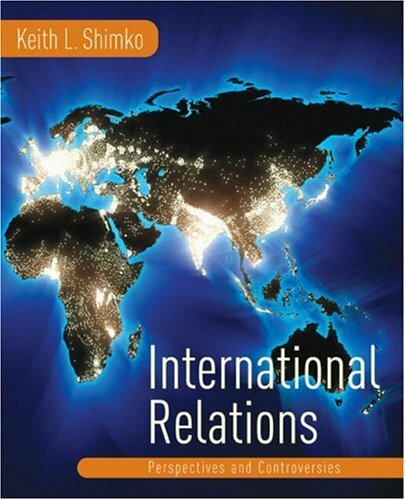 Each of the topical chapters (313) includes a feature, Points of View, which uses primary source documents to demonstrate the ideas, debates, and arguments about international relations. These documentsfrom sources such as official foreign policy statements, government papers, and editorialsextend the chapter discussion both in and outside the classroom. Additional pedagogical features include marginal key terms and definitions, chapter summaries, discussion questions, and suggestions for further reading. Keith L. Shimko, Ph.D., is associate professor of political science at Purdue University. He has taught Introduction to International Relations since 1990 and has won several school and university-wide teaching awards. Dr. Shimko is the author of IMAGES AND ARMS CONTROL: PERCEPTIONS OF THE SOVIET UNION IN THE REAGAN ADMINISTRATION (Michigan, 1991), which was named a CHOICE outstanding academic book and received the Lynne-Reinner/Quincy Wright Award, as well as THE IRAQ WARS AND AMERICA'S MILITARY REVOUTION (Cambridge, 2010). He received his B.A. from Franklin and Marshall College and his Ph.D. from Indiana University. Are Democracies Really Any Different? What Is International Law and Where Does It Come From?